(162) And ask them about the town that was by the sea - when they transgressed in [the matter of] the sabbath - when their fish came to them openly on their sabbath day, and the day they had no sabbath they did not come to them. Thus did We give them trial because they were defiantly disobedient. (163) And when a community among them said, "Why do you advise [or warn] a people whom Allah is [about] to destroy or to punish with a severe punishment?" they [the advisors] said, "To be absolved before your Lord and perhaps they may fear Him." (164) And when they forgot that by which they had been reminded, We saved those who had forbidden evil and seized those who wronged, with a wretched punishment, because they were defiantly disobeying. (165) So when they were insolent about that which they had been forbidden, We said to them, "Be apes, despised." Sound like a fractured Midrash to me. In any case, where is this town by the sea? According to most Islamic scholars, the city is Eilat(*). Islamic sources mention four Jewish settlements in the Gulf of Eilat area: Adhruh, Jarba, Maqna and Eilat. Maqna and Eilat were situated on the coast, Maqna being further south than Eilat. Adhruh and Jarba were to the north, further inland. These Jews grew dates (an occupation common among the Jews of Arabia), fished and kept horses. Their women spun and wove textiles. They carried weapons and owned slaves. When Muhammad approached Israel, after arriving at Tabuk, these communities sent delegations to the new conqueror. "Yuhanna son of Ru'ba, king of Eilat, came to the Prophet, and with him the residents of Jarba and Adhruh. And they came to the Prophet, and he taxed them, and he wrote them a letter saying: 'In the name of Allah the Merciful, this treaty is given from Allah and his messenger Muhammad to Yuhanna son of Ru'ba and to the residents of Eilat, their ships and their services, in sea and land. The protection of Allah and Muhammad is given to them, and to the Syrians and Yemenites and peoples from across the sea who live with them. And if any of them break the law, his property will not protect him, and will be to whoever takes it. And they are not to be prevented from the water they want to access, or the way they want to pass in, in sea and land. Written by Juhim bin-Salat and Shurhavil bin-Hasana, written with permission of the Messenger of Allah." And he continues: "Muhammad Ibn 'Omar (Al-Waqidi, 8th century) says: I copied the letter of the people of Adhruh that says: In the name of Allah the merciful! This is the treaty of Muhammad the Prophet with the residents of Adhruh, which gives them the protection of Allah and Muhammad, and they must pay 100 dinars, pure gold, on the month of Rajab, and they guarantee in the name of God that they'll be loyal friends and act well towards the Muslims who turn to them for shelter due to fear or danger when they fear Muslims, and they can be certain Muhammad will not attack them without meeting with them first." "And the Messenger of Allah taxed the people of Eilat 300 dinars, and they numbered 300 men." "And the Messenger of Allah wrote to the residents of Jarba and Adhruh. This is the letter of Prophet Muhammad to the residents of Jarba and Adhruh, that a treaty is given to them by Muhammad, and they need to pay 100 dinars of pure gold every month of Rajab. And they guarantee this in the name of God. and the Messenger of Allah wrote to the residents of Maqna, that they are to receive the protection of Allah and the protection of Muhammad, and they must give a quarter of their property and their boats." "Muhammad Ibn 'Omar said Ibn Abu Zueiba said in the name of Salah, who lived under al-Tuema's protection, that the Messenger of Allah made a pact with the residents of Maqna, in order to take a quarter of their fruits and a quarter of their textiles. Muhammad Ibn 'Omar said: The residents of Maqna were Jews who lived on the coast. And the residents of Jarba [Prof. Moshe Gil adds: and Adhruh] were Jews as well." Jarba, Adhruh and Maqna are specified as Jewish. Eilat had a significant Jewish community, and as we saw before, Muslim scholars throughout the ages fingered it as the town of Jews mentioned in the Quran. Ya'qubi (9th century), tells us that Muhammad gave his cloak to the 'King of Eilat', Yuhanna son of Ru'ba (Yochanan ben Reuven). It's unclear whether this king was Jewish. He represented both Jews and Christians when speaking with Muhammad, and there are some opinions he was Christian. But there are several sources that tell us he was Jewish. Estakhri, a 10th century geographer, writes that the Jews of Eilat kept the document they got from Muhammad. Makrizi (15th century) says as follows: Eilat had many mosques and many Jews who say they have the cloak of the Prophet, who sent it to them as a guarantee (collateral), and it was made of Adani cloth, wrapped in other cloths, so that you could only see a bit of it." It is also much more likely that the people wanting to strike a deal with Muhammad were the Jews, who hated the Christian Byzantines. In Prof. Moshe Gil's opinion, the semi-autonomous Jewish community of Yotva (Tiran Island), which existed in the late 5th and early 6th centuries, stretched from Tiran to Eilat, along the coast of the Gulf of Eilat. Similar stories are told about the other communities. 9th century historian Al-Baladhuri wrote that he met an Egyptian who saw the signed treaty kept by the Jews of Maqna with his own eyes, written on red parchment in fading script. The Egyptian dictated the contents of the treaty to Al-Baladhuri. The story is repeated again by Yaqut al-Hamawi in the 13th century. A similar tale about the Jews of Adhruh and Jarba is told by Al-Bakri (11th century). What is clear from all these stories, is that the area had a significant Jewish population, which existed for hundreds of years after the Muslim conquest. We hear about the Jews of the area in other contexts as well. In the early 9th century there were repeated rebellions against the Abbasids, both by Muslims and non-Muslims. It is important to stress here that until the Crusader era, the majority of the population in Israel was Christian, not Muslim. Around the year 800 a Jew named Yahiya ben Yirmia (Jeremiah) led a rebellion together with two Muslim deputies. Yahiya came from the Moab region (southern Trans-Jordan), and there is much more to write about the Jewish communities there. In 807 another rebellion broke out, centered around Eilat. The rebels, led by a man named Abu'l Nida, revolted against the high land-taxes, which were imposed exclusively on non-Muslims, though the rebels were later joined by Bedouin tribes. The rebellion lasted for several years before it was put down. This rebellion was followed by the wholesale destruction of churches and Samaritan synagogues throughout the land, though it's unclear if this was retaliation or a coincidence, since in the meantime the Muslim Calif, Harun al-Rashid, died, which started off an inheritance war. Prof. Moshe Gil points out that through Jews aren't mentioned specifically, it is quite likely Jewish synagogues were destroyed as well. (*) Eilat is, of course, known today as Aqaba. 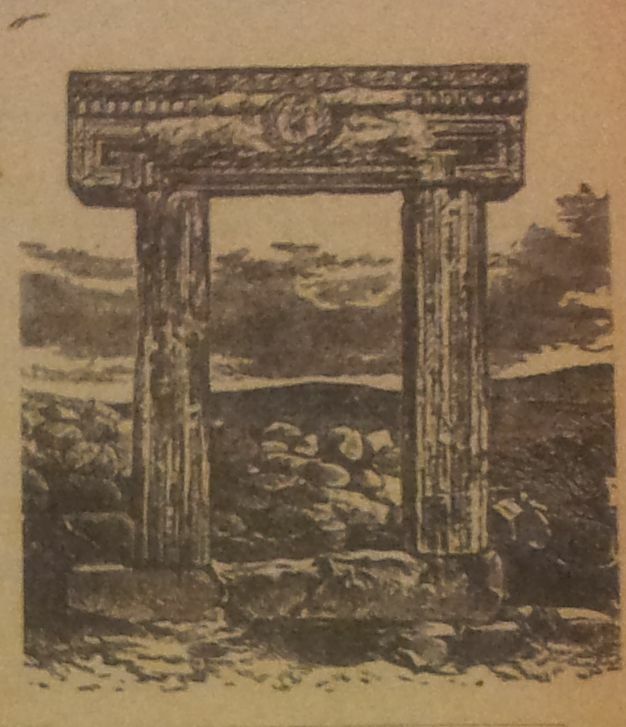 The city was called "Ayla" by the Romans. By the 12th century Muslim geographers referred to it as "Aqabat Ayla" (Pass of Ayla), which was later shortened to "Aqaba". Had it ever snowed in Israel in the summer? Two people have reported snow in the month of Sivan (late May-early June), though in both cases, it was hearsay. 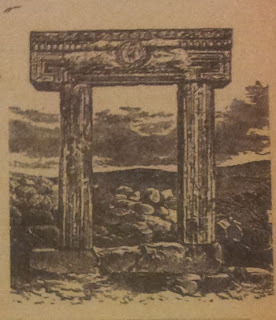 On the lintel of the smaller entrance it is inscribed in Hebrew "May G-d give peace to this place and to all the places of Israel". And I was told that on another stone which had fallen down was written "Don't be surprised about snow in the month of Nissan, we've seen it in Sivan". The Hebrew inscription is unusual, as most inscriptions in Byzantine synagogues are in Aramaic. The synagogue was researched in the late 19th century, but by 1907 there was nothing left of its stones. The local Arab villagers had destroyed it completely and ransacked it for building materials. The 'snow' inscription was never found. The lintel inscription is on display in the Louvre. In 1844 it snowed a bit on the night and morning of April 11 (22 of Nissan) [... Schwarz then goes on to bring various examples of snowy years...]. In 1754 there was a lot of snow and it was very cold, and so 25 people died in the Galilee in Nazareth of the cold, and I heard from an old man that the snow continued that year until the month of Sivan [late May], and there was barely a minyan that year on Shavuot in the synagogue here in Jerusalem, because that night it snowed so much that barely anybody could go out for morning prayers. 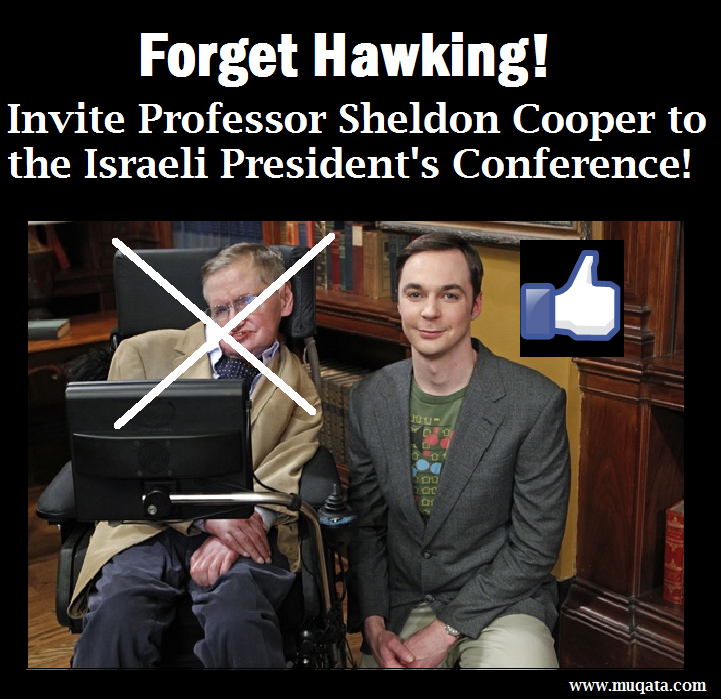 Forget Hawking - Invite someone MUCH better! Hawking is free to boycott whomever he wishes. But so are we. 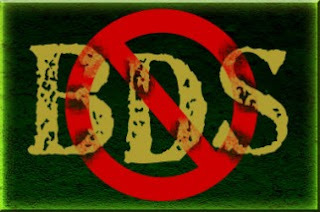 If you are outraged by Hawking's promotion of hate and his support for the anti-Israel BDS campaign -- then don't reward him for it. Don't support him. DON'T BUY HIS BOOKS OR HIS FILMS. And encourage others not to either.